NEET MDS Counselling 2019 - Directorate General of Health Sciences (DGHS) on behalf of Medical Counselling Committee (MCC) has advised the qualified aspirants who qualified for NEET MDS 2019 counselling to report at the allotted colleges before 06:00 PM of April 22. After that, the remaining vacant seats under 50% AIQ seats will be tranfered to the state counselling authority for allotment of seats under state quota seats. MCC has released the final result and allotment letter of NEET MDS 2019 counselling on April 11, a day before the actual schedule. Earlier, the provisional seat allotment list was also released after the conclusion of round two of NEET MDS counselling on April 11, 2019. The link to download the result is available on this page. Along with the provisional result, MCC also published a notice stating that in case of any discrepancy in the allotment list candidates can mail at [email protected]. The second round of NEET MDS 2019 counselling commenced on April 5. LATEST: Final seat allotment list of NEET MDS Counselling Round 2. Check details below! The authority has also declared a holiday for MCC helpdesk in Uttar Pradesh, due to Lok Sabha elections, through a notice for candidates and institutes participating in NEET MDS 2019 counselling. However, it also states that the administrative office at Nirman Bhawan in New Delhi will remain open to help medical graduates for admission to MDS courses. Also, a notice for institutes has been released mentioning that the admission/academic cell should be opened to help the candidates for NEET MDS counselling 2019. Earlier, the authority extended the date to resign from a seat allotted in the first round of NEET MDS counselling 2019. The candidates had to resign by reporting in person to the allotted college till April 8, 2019, up to 5:00 PM. Earlier, the authority released the final and provisional seat allotment list for round one of NEET MDS 2019 counselling on March 27. NEET MDS seat allotment letter for round one has also been made available by the authority. A link to download the result and allotment letter has been made available on this page. The round one of NEET MDS counselling concluded on March 24 which was later extended till March 26, 2019. The total seat matrix of NEET MDS seat allotment has been released and the link is also available below on this page. The eligible candidates will be granted admission to 50% All India Quota seats and 100% seats in Deemed and Central Universities. MCC will conduct NEET MDS 2019 counselling in online mode. For participation in the counselling of NEET MDS 2019, aspirants must secure the minimum qualifying cut off percentile and marks. NEET MDS 2019 counselling for 50% All India Quota seats will be conducted in two rounds, while the counselling for deemed and central universities will be held in three rounds including mop-up round. In order to participate for NEET MDS 2019 counselling, the eligible students had to register themselves for first and second rounds. Based on these preferences, NEET MDS rank and availability of seats, the admission to around 1323 seats under 50% AIQ quota, deemed and central universities will be granted. Candidates who will allotted seats must report at the particular college for document verification and completion of admission process. Read the article on NEET MDS counselling 2019, registration process, result, dates and other details. NEET MDS 2019 was conducted on December 14, 2018, in computer-based mode. The 240 multiple choice questions are asked in the exam from Physics, Chemistry and Biology based on curriculum studied in BDS programme. NEET MDS application form 2019 was made available on October 16, 2018, in online mode only. 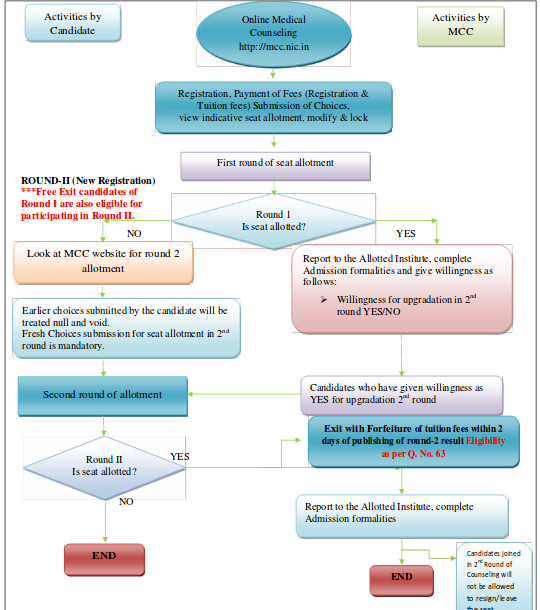 Candidates can go through the dates of counselling of NEET MDS 2019 from the table below. To download the NEET MDS counselling 2019 second round result, click here. 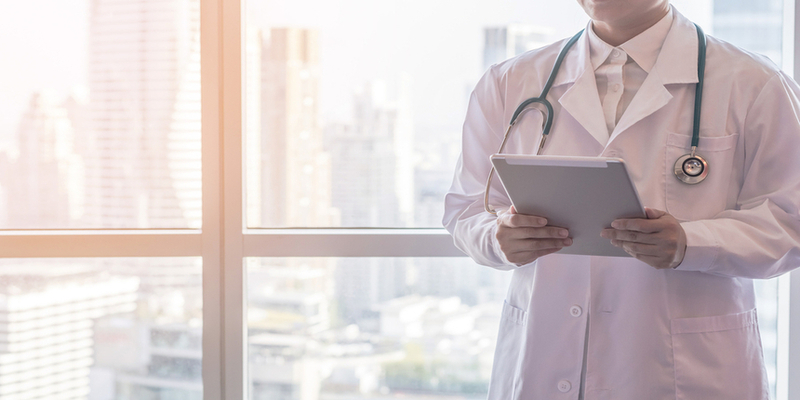 MCC has released the NEET MDS counselling result for round two on April 11, 2019. Candidates can check the result with the help of link provided above. The result has been determined on the basis of NEET MDS merit rank, preferences filled and seats available. The result is published in the form of a list including the name, allotted college, All India Rank, remarks (allotted/not allotted) and allotted as well as candidate category. Students who has been allotted seat are required to download the allotment letter of NEET MDS counselling 2019. The allotment letter will include the name of the candidate, rank, college allotted and other details. It is mandatory to carry the allotment letter along with the list of documents at the allotted institute/college/university for admission process. How to download NEET MDS Seat Allotment Letter 2019? Candidates whose name has been listed in the final list of allotment can download the NEET MDS 2019 seat allotment letter as mentioned in the procedure below. Click on the link provided on this page above. Select the stream and round. Enter the roll number and captcha code mentioned. The allotment letter will be displayed on the screen mentioning the NEET MDS rank, category rank, marks obtained, college and category allotted, date and time of reporting among others. Verify the details and download the seat allotment letter of NEET MDS counselling for further admission process. Only candidates who will be securing the minimum qualifying NEET MDS 2019 cut off as mentioned by National Board of Examinations (NBE) will be eligible to appear for the counselling process. NEET MDS cut off for general category aspirants is 50 percentile, while for SC/ST/OBC category candidates, it is 40 percentile. In respect to persons with disabilities, the cut off for general and reserved category aspirants will be 45 and 40 percentile, respectively. NEET MDS cutoff 2019 has been announced by NBE along with the result on January 14. The qualifying cutoff and corresponding marks are mentioned in the table below. Last year, due to lack of aspirants securing the marks equivalent to the minimum cut off percentile, the Medical Council of India in consultation with central government lowered the cut off percentile. Check the previous years NEET MDS cut off percentile and the mark corresponding it. MCC has released the total seat matrix of NEET MDS counselling 2019, which is available below. NEET MDS 2019 counselling seat matrix has been published separately for 50% All India Quota seats, Deemed Universities and Central Universities. The counselling for AIQ seats, deemed and central universities will begin from the second week of March 2019. NEET MDS AIQ counselling will be conducted in two rounds. Once the counselling rounds are completed, the vacant seats left will be transferred to the state counselling authorities for state quota seats. In the first step, aspirants need to click on the link provided on this page to register themselves for NEET MDS counselling 2019. For registration, candidates need to select the stream (medical/dental), NEET MDS roll number, application number, name of candidate, date of birth, security pin etc. The agreement page will be displayed on the screen in which aspirants either need to click on ‘I Agree’ or ‘I don’t agree’. In case, students need to continue registering for counselling process, they can click on ‘I agree’ and move for the next step. Thereafter, the login credentials will appear on the screen which must be preserved until the completion of admission process. In the next step of NEET MDS 2019 counselling, aspirants are required to enter their personal details such as father and mother name, address, category and other details. Candidates must fill the details carefully while filling the details, as the details once filled cannot be edited and the similar information filled here will be required at the time of document verification and admission. The non-refundable registration fee and refundable tuition fee must be paid by the candidates in online mode only through credit/debit cards and net banking. Check the refundable tuition fee and non-refundable registration fee from the table below. After the successful payment of registration fee, the registration slip will be displayed on the screen. A printout must be taken of the registration slip which will be useful for the further admission process. Click on ‘login’ for the next step. 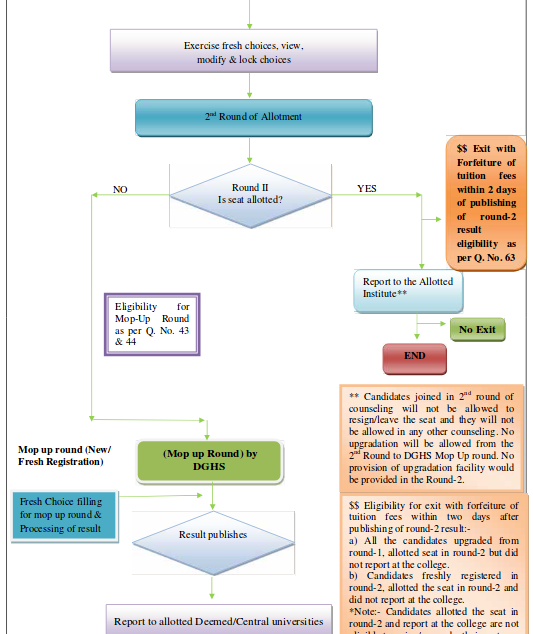 In the beginning of the counselling of NEET MDS 2019 process, the available choices will be displayed on the left-hand side of the screen. Candidates who submitted the fees for 50% AIQ/Central and Deemed universities can fill the choices under every category of seats. For the selection of preferences, candidates must click on ‘+’ button available with every option. After the selection, the choice available on the left-hand side will automatically shift to the right-hand side of the screen. Once all the selections are done, candidates need to click on ‘save and continue’ button to save and continue with the process by clicking on ‘save and go to the home page’ to exit. While filling the choices, aspirants can move up and down and delete the choices. Also, they can drag a choice to interchange with others. For the future benefits, aspirants are advised to take a printout of the preferences filled. If anyone has not locked their choices filled, then also they can take the printout of the preferences once the locking process is over. Here is the list of documents which must be carried to the allotted institute/college/university for document verification and completion of admission process. Any candidate without any document will not be granted admission to MDS courses. Also, aspirants are advised to take the originals and a set of photocopy of all the required documents. Certificate for completion of internship from the head of the institute stating the candidate has completed the internship on or before March 31, 2019. The second round of NEET MDS 2019 counselling commenced on April 5, 2019. The eligibility of candidates appearing for the second round is listed below. Who is eligible for NEET MDS second round counselling? The counselling of NEET MDS 2019 for remaining 50% state quota seats will be done by respective state counselling authorities on the basis of scores obtained in NEET MDS. Only 100% from Jammu and Kashmir will be granted under state quota as the government does not participate under All India Quota seats. The state authorities will release their schedule for NEET MDS 2019 state counselling. The state merit list for the domicile aspirants will be derived on the basis of NEET MDS merit list. Below are some of the frequently asked questions related to NEET MDS 2019 counselling asked by the students. Question: Will NEET MDS counselling be conducted in offline mode? Do I have to report at the counselling venue? Answer: No, the entire counselling of NEET MDS 2019 will be conducted in online mode. The counselling including registration, choice filling and locking, seat allotment process and the announcement of result will be done in online mode only. Question: How many choices can I fill during counselling? Answer: A candidate can fill any number of choices they wish to. However, it must be ensured that the choices filled must be in the order of their preference. 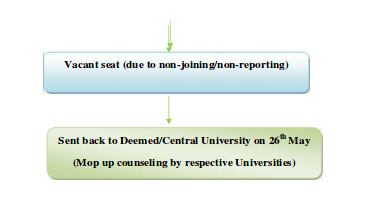 Question: If a candidate is not allotted any seat in the second round of counselling, then will the seat allotted in first round get cancelled? Answer: The seat allotted in the first round of NEET MDS 2019 counselling will not be cancelled. 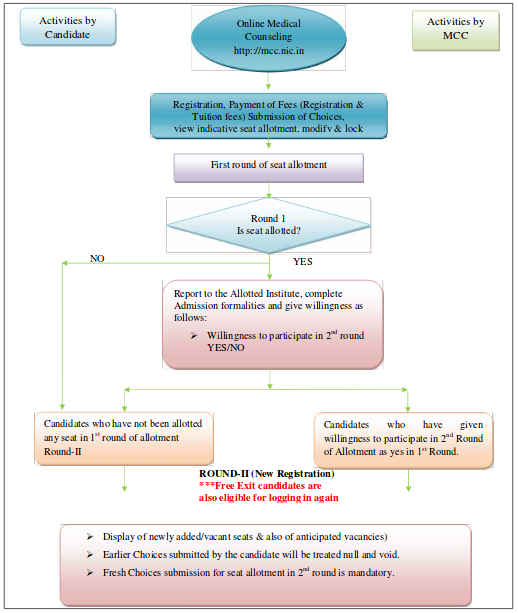 If any candidate will not be allotted seat in the second round, then the seat allotted in round one will be considered final. Question: Will a candidate get any seat allotted if he/she has not locked the preferences? Answer: In order to participate for counselling, aspirants need to register. Also, they need to fill their choices and lock it. However, if they have not locked the preferences, then the filled in choices will get locked automatically and considered as the final one.